This section of our website is intended to provide state, school, teacher, and student success stories as we move through implementing the full NCSC assessment system developed with a research-based understanding of: a) technical quality of the design of alternate assessments based on alternate achievement standards, b) formative and interim uses of assessment data, c) summative assessments including items derived through an Evidence-Centered Design process, d) academic curriculum and instruction for students with the most significant cognitive disabilities, e) student learning characteristics and communication, and f) effective professional development. We encourage you to share other success stories with us by contacting Liz Towles-Reeves at: liz@ncscpartners.org. Check back each month for a new success story that just might be from your state! Inclusive Assessment Design, Development, Evaluation, and Data; Accessibility Strategies; and Voices from the Field – NCSC Inclusive Assessment Overview (PDF) This collection of slides covers several topics related to NCSC’s approach for development of inclusive, accessible assessments. We will share information in this way until final reports on our development processes and outcomes are completed late in the project. We are also doing project presentations and papers at events like AERA, NCME, TASH, and CEC annual meetings, and the CCSSO National Conference on Student Assessment. Our curriculum, instruction, and professional development resources are not covered in this set of slides. Please go to https://wiki.ncscpartners.org to view these resources. They are part of our accessibility strategy - by increasing opportunities to learn for both teachers and students. NCSC Multi-Phase Field Test Activities Continue! Test Administration Manual now publicly available. On October 20, we began the second phase of the NCSC large-scale pilot testing of our summative assessment. Pilot 2 is part of the NCSC comprehensive approach to field testing of our system and items. Pilot 2 specifically is designed to help us refine our test forms prior to our operational test in Spring 2015. Thank you so much to all the practitioners who have been willing to partner on our development thus far! Now that we have begun Pilot 2, we are posting the Pilot 2 Test Administration Manual (TAM) for public access. Pilot 2 is one part of the comprehensive NCSC approach to field testing. Our comprehensive approach to field testing has also included a set of research studies, including student interaction studies where we worked directly with teachers and students in trying out our platform and our items, action research designs where we partnered with teachers to understand accessibility options for students with the most complex needs, survey research to learn what was working and what needed improvement to our platform and items, as well as a two-phase large-scale pilot test. The first phase of the two-part pilot, Pilot 1, was conducted last spring, and resulted in item statistics for our entire item bank, culminating in item data review and revisions. This fall and winter we look forward to finalizing our NCSC assessment operational forms based on results of Pilot 2, in continued partnership with state and local practitioners. This field testing approach builds on our evidence-centered design (ECD) item development process, also done in close collaboration with practitioners. Thanks again to all who have been such important partners to our work! Gearing up for the Spring 2015 NCSC Operational Assessment! I just wanted to let you know that I am still using all the LASSI and MASSI materials and even developing some of my own LASSIs. We are currently reading To Kill a Mockingbird and having tremendous success! All students are able to interact with the text through the use of visuals. Some of the students are reading and USING grade level vocabulary words (their families are amazed). They are learning to make inferences. They feel proud of themselves because their general education peers are reading the same book. I have overheard my high school student aides asking my students with moderate/severe disabilities what a vocabulary word means (talk about a reversal of roles) and my student was able to tell them. It is my mission to inform as many teachers as possible about these valuable teaching resources. I so appreciate all the hard work that NCSC has done to make teaching grade level content to students with moderate/severe cognitive disabilities a reality filled with success stories. I am so grateful to have had the opportunity to be a part of the work. It has made me a better teacher. Watch this space over the next weeks for updates on the Wiki. We also will be highlighting information for parents and IEP teams, sharing the current version of the Test Administrator’s Manual (TAM), and posting the final operational test blueprints! Pilot 1 Testing Complete: Thanks to all of our SEA and LEA partners for completing the Pilot 1 testing this past week. We had two states meet 100% of their assigned tests, with two other states at 85%, then 84; 79; 75; 76; 71; two at 68; 66; 64; 51; 29; 22; 21; and 11! Thank you also to those states/LEAs that participated in the intensive writing evaluation and accessibility studies, as well as the Student Interaction Studies (SIS, cognitive labs) during the Pilot 1 testing window. We look forward to a summer of data reviews and design heading to our Pilot 2 Field Test of test forms in October and November, 2014. Final week Pilot 1 data: As the pilot draws to a close today, here are 'near-final' usage statistics. To date, we have 7,433 tests completed and another 227 in progress. 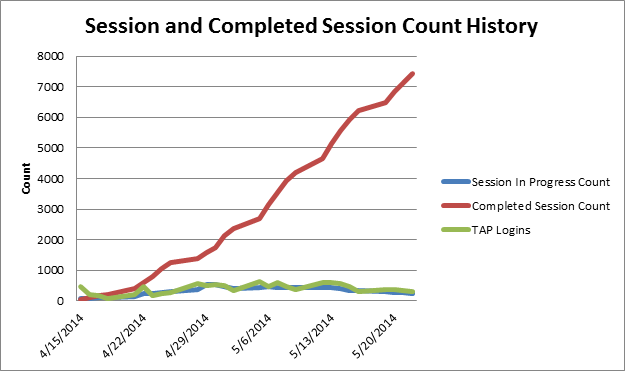 Since the start of the pilot test, the system has registered 11,167 logins. 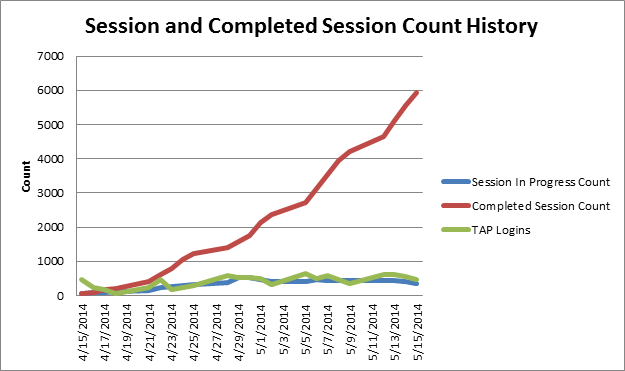 Overall, approximately 48% of the total assigned tests have been completed. Thanks to everyone for your hard work. States ranged from 0-100% completion of tests assigned, with all but 4 states over 50% completion as of mid-day Friday (state assigned-test completion percentage rates as of midday Friday were: 100%, 85, 84, 83, 79, 79, 73, 71, 68, 66, 63, 61, 51, 27, 20, 21, 0). We look forward to working with you all on the fall 2014 Pilot 2 Field Testing of our test forms, derived from Pilot 1 data! NCSC Pilot 1 Testing Continues! 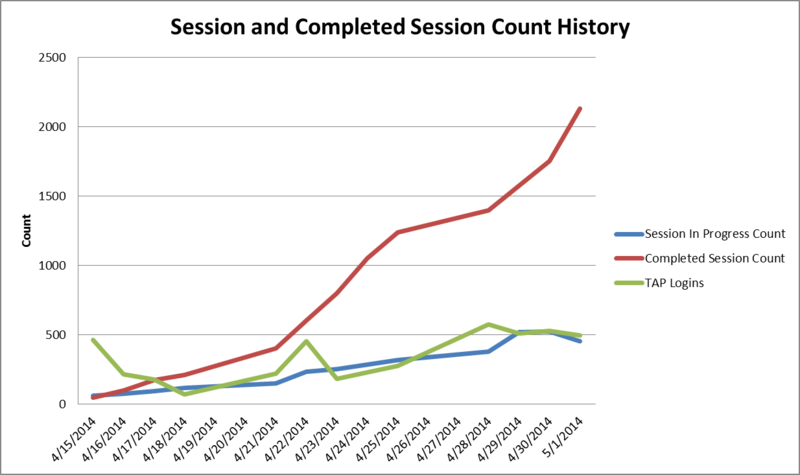 As the 5th week of the pilot nears completion we’ve continued to observe steady participation. To date, we have 5,937 tests completed and another 349 in progress. 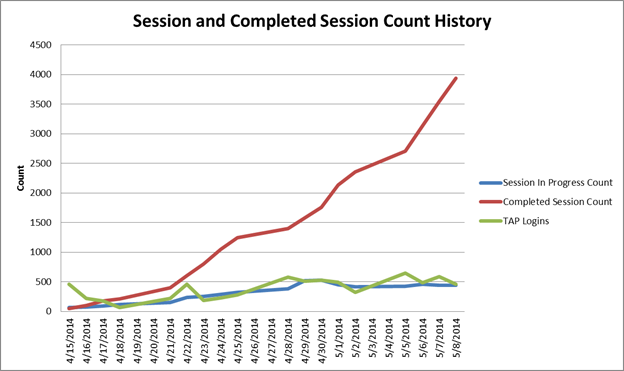 Since the start of the pilot test, the system has registered 9,477 logins. Overall, approximately 37% of the total assigned tests have been completed with seven states that have completed over half the assigned tests: Arizona, Connecticut, Idaho, Maine, Montana, South Dakota, and Tennessee. Thanks to everyone for your hard work, and thanks in advance for your continued efforts to encourage participation in our final week. Please remember the pilot closes at the end of the day May 23, 2014. The South Dakota Department of Education (SDDOE) is working closely with our NCSC project liaison to disseminate the NCSC mathematics curriculum and instructional materials throughout the state. The SD Community of Practice (CoP) came together in September of 2012 for a full day of training on NCSC mathematics resources. Teachers enthusiastically accepted hard copies of the Mathematics Instructional Families both conceptually and literally during the training and gave valuable feedback for the roll-out of the materials to the entire state. The state wide roll-out of NCSC materials was January 6-11, 2013 in 4 venues: Rapid City, Pierre, Aberdeen, and Sioux Falls. Over 300 special education teachers and others were trained on the mathematics resources. Some of the CoP members volunteered to co-train and gave personal testimonies about their use of the materials. South Dakota teachers volunteered to pilot MASSIs this past year as well. All of the CoP members participated in the MASSI webinars and follow-up WebEx conversations. Eleven of the SD CoP members piloted the actual MASSIs in their classrooms and provided feedback to UNC Charlotte including but not limited to video tapes of SD teachers using the MASSIs in their classrooms with SD students. In addition, a SD Augmentative and Alternative Communication (AAC) Workgroup was established following the NCSC Communication Summit last summer and met monthly throughout the year. This group was instrumental in building the communication portion of SD’s transitional action plan. The AAC workgroup has some CoP cross-over membership, as well as an autism specialist, occupational and speech therapists, and other specialized membership. The sole focus of this group is to build communicative competence throughout the state of SD. Presently, they are distributing a state-wide survey to establish the prioritized needs to build the trainings and personalized classroom supports. Finally, the NCSC initiative and materials were accepted for three separate break-out sessions at the state Council for Exceptional Children (CEC) conference in March. Some members of the AAC group presented on the communication initiative while other SDDOE staff provided a NCSC overview in one session and presented the math resources in another. We look forward to continued dissemination within our state. The Indiana Department of Education is working closely with Project Success, an Indiana Special Education Resource Network member, as well as our NCSC project liaison to disseminate the curriculum and instructional materials developed by the NCSC project. Currently these materials are being used to add supports and adaptations for students with the most significant cognitive disabilities to grade level lessons based on general education standards. The NCSC curriculum and instructional materials are being aligned to the newly adopted Indiana Academic Standards and are the basis for ongoing professional development and on-site technical assistance. During the summer of 2014, over 200 teachers, administrators, and support staff will participate in a full day training session designed to introduce materials and provide structure for implementation. Indiana teachers using LASSIs, Element cards, and other NCSC materials during the 2013-14 school year provide an overview and video model of implementation. In addition, participants engage in conversations of philosophy and practice around the shift from functional skill to academic skill instruction and how to balance the needs of students with significant cognitive disabilities.